Mike Boyd joined the Sign-Age team in 2012. 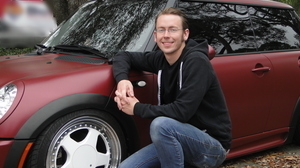 He comes to us with a long mechanical background and has a real passion for cars; just ask him about his custom Mini Cooper! Since entering the sign industry his passion for cars has grown even more. He loves doing vehicle wraps! In a very short time Mike has become a super installer and earned his PDAA Master Certification!